One of Japan’s most internationally well-known resorts, Niseko United is the most popular ski resort among international tourists and skiers. A conglomeration of 5 resorts on a single mountain, Niseko United is easily the largest ski resort on offer in Japan. 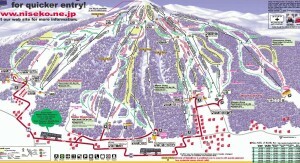 This is reflected in it successfully being awarded Japan’s Best Ski Resort, two years running at the World Ski Awards. With its abundant powder and its high popularity, the competition to ride the fresh slopes of Niseko are fierce. 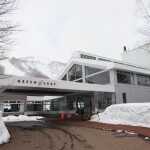 The entire resort consists of Annupuri, Niseko, Hirafu, Hanazono and Moiwa, with Hirafu being the biggest of the 4 resorts, all of which are interconnected by frequent shuttle buses. The resort itself has a wide range of runs on offer suitable for beginners, intermediaries and families, with powder hound needs catered for as well. A large range of options for backcountry and sidecountry skiing are extremely enticing and the resort permits both out of bounds riding and off-piste riding, offering a variety of tree skiing and alpine options on demand. While difficult to navigate alone, with a guide to help you, the opportunities on Niseko’s ungroomed runs are close to endless. Niseko United’s international popularity has meant that all shops and services have been adjusted to cater for international visitors, thus English is commonly spoken throughout resort facilities and villages with stacks of detailed English information guides to help make the most of the area, which include plenty of restaurants, cultural activities, entertainment and shopping opportunities. Note that the resorts’ popularity means that it may be necessary to be up there early, in order to make the most of the snow! 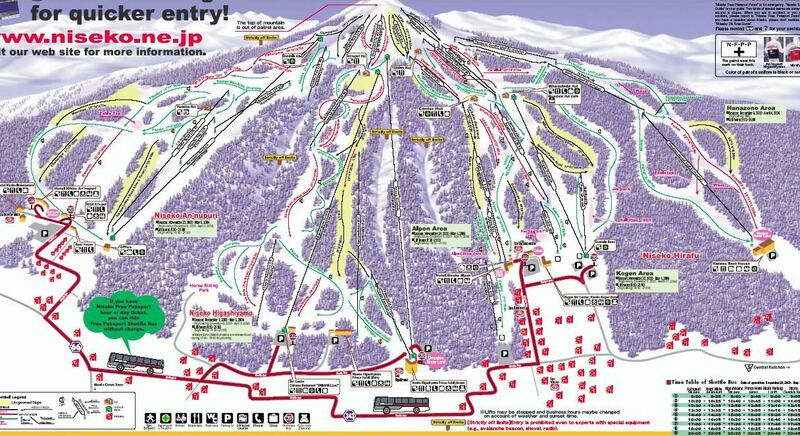 The united lift pass includes all resorts, except Moiwa; a small resort to the west of Annupuri. The in-resort bus service too, does not offer transport to Moiwa. Keen for a powder-filled adventure? Powder Ski Japan is offering a special deal with discounted prices for a tour through Niseko’s lush backcountry with a knowledgeable local guide and personal friend of founder Hiro. Tours are available in both Japanese and English. *Offer courtesy of Hiro Ueda. Niseko United Ski Resort is situated in 100kms southwest of Sapporo and takes about 2.5 – 3 hours by bus from New Chitose Airport. The town of Niseko has four areas which are interconnected, made up of Annupuri, Hirafu, Hanazono and Niseko Village. 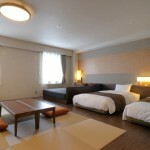 We provide transfer options to and from New Chitose airport and the villages within Niseko United. We will organise buses according to where you are staying and will organise door-to-door services if necessary, as well as a meet and greet at the airport. If you wish to travel to Niseko via private transfer, we provide a number of options to cater for your transport needs, regardless of group size. Niseko is surrounded by a number of other ski resorts. Organised buses to travel to other resorts are available at your convenience, so please contact us with your plans or queries. Shuttle bus services are active throughout the resort, linking each area of Niseko (Niseko Village, Hanazono, Hirafu and Annupuri) together. Niseko Village is located around 20 minutes from Hirafu and the village of Annupuri is located 20 minutes away from Hirafu. If you have a Niseko All-Mountain Hourly Pass or Day Pass, then boarding shuttle bus services are free of charge. The shuttle service does not work after 9:30 pm. As mentioned earlier, NIseko United offers other snow-based activities such as snowmobiles, snow rafting and sledding, but also a number of backcountry and off-piste options, including CAT tours. Villages within the area provide plenty to do, with spas, onsen hot springs, shops, arts and crafts and Japanese cultural activities and performances. Ski rental shops are located near slopes that offer you all the requirements of rentals that also include fat skis and snowboarding equipment. Certain rental shops also offer performance gear hire. Each village within Niseko United provides a number of child care services, some of which provide ski lessons. Depending on the service provider, some will have English-speaking staff while others may not. It may also be worthwhile to check the age ranges of children that each place offers to look after. It’s probably worthwhile to make reservations beforehand and double check if places require a pre-booking or not. A large number of different ski and snowboarding schools operate throughout Niseko United. Programmes are offered at each of the four areas of Niseko for skiing and snowboarding. These cater for both children and adults and for varying skill levels. Private and group lessons are also available, as are lessons in English. Niseko, Hirafu and all surrounding areas offer a generous range of restaurants and eateries. These range from traditional Japanese cuisine, to overseas dishes, as well as a couple of fusion restaurants for some culinary flare. There is no ATM access at Niseko, so careful monetary planning is necessary. There is only one ATM, located in Shiki Niseko (Hirafu Village). In Kutchan, the main post office and all 7-Eleven convenience stores have ATMs. This is important as many of the shops and restaurants do not accept credit cards. Lift tickets and gear rentals however can be paid for by credit card. Located at the base of Mount Niseko Annupuri in Japan, The Green Leaf Niseko Village lies in the heart of one of the world’s best skiing destinations. The hotel refurbishment has produced stunning results, garnering awards and accolades since its launch in 2010. 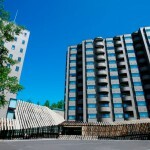 Hotel Niseko Alpen is located in the heart of the Niseko mountain range, surrounded by beautiful nature. 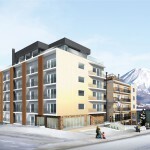 Luxuriously appointed & supremely comfortable, Chalet Ivy in central Hirafu is Niseko resort’s premiere boutique hotel. All suites are equipped with balcony and kitchen,the hotel can afford a new level of comfort and relaxation.